This week’s flash fiction challenge isn’t so much about a story as it is about poetry. Haikus, to be exact. I used to teach poetry. The result of this is I can punch out a Haiku in about ten seconds. My cat is sitting right next to me, so I’ll write one about her. Okay, that took fifteen seconds. So Dan put a random topic generator on the challenge. They’re questions meant to start a conversation. I think he suggested writing one but I’ll take a whole minute and write four. 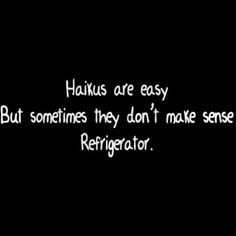 I’ll start with the question and answer with the haiku. PS – this is the weirdest thing I’ve done all week. What kind if old person do you want to become? Describe yourself in one sentence (or haiku). Do you prefer to travel or stay close to home? Can I please go somewhere warm? Those are mine! I encourage fellow bloggers to play along. This was fun. Here’s the link to the finalist round! Anyway, I stopped by to say you may have some competition. These referenced adult beverages and so got extra points. Prepare for a Haiku-off Saturday Morning EST sometime. What a load of fun! What type of old person do you want to become? I didn’t know that was a thing. I fully support wine for dinner though. BUT! Kudos to me for thinking up the strangest thing you did all week. See, and like floof isn’t a word. I don’t get it. Maybe limericks would be more up your alley. Oh, I know me some limericks. None fit to reprint here, though.